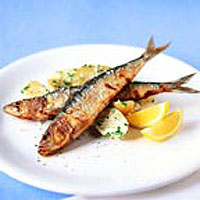 Coat fresh Cornish sardines in flour seasoned with flaked sea salt and coarse black pepper. Fry in a hot pan with butter and a little groundnut oil until crisp and golden. Serve with lemon wedges and a seasonal new potato salad tossed in lemon mayonnaise, cream and fresh chives.